“AMM” SS Repair Clamp are flexible clamps consisting of one or more stainless steel, rubber lined, band sections. They are used for a quick, easy and permanent repair of corroded, damaged or broken pipes. They can be applied to Ductile Iron, Grey Cast Iron, Steel, AC and PVC pipes. The clamp contains no loose parts that may get lost during installation. 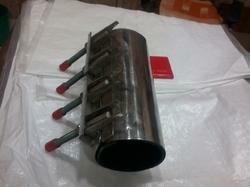 Material parts : stainless steel AISI 304 OR AISI 316. All parts have been debarred and are passivated to return the corrosion resistance after the welding process to its original state. 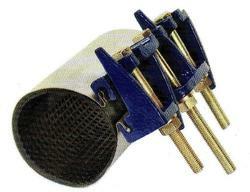 Repair clamps are available in single or Multi Band, (SS-1-Range 11mm SS-2 Range 22mm SS-3 Range 33mm). The band is TIG welded to the sidebars, the lugs & bolts are MIG welded to the sidebars. Keeper-Bar is provided with lip. Electro Zn plated Nuts or Teflon Coated Bolts are provided to prevent galling. FOP washers are provided to reduce function between nut ant keeper-Bar which also functions as a torque indicator. No special tools required, a simple wrench will do the job. Special tape is used to fix the rubber gasket to the stainless steel band. The tape is flexible and reinforced with glass fiber thread to resist hot and humid climatological circumstances guarantee a long storage capability. 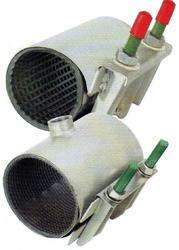 Under most circumstances the Clamps can be installed without releasing the pressure of the pipe. Leak Repair Clamps are flexible clamps consisting of one or more stainless steel, rubber lined, band sections. They are used for a quick, easy and permanent repair of corroded, damaged or broken pipes.They can be applied to Ductile Iron, Grey Cast Iron, Steel, AC and PVC pipes. The clamp contains no loose parts that may get lost during installation. Single wrap around design and varied bolt lengths allow for quick and easy installation. Female & Male bosses available to take off supply. Stainless steel and mild steel versions. Available with EPDM or Nitrile gaskets. Available in length of 200mm and multiples of it. Suitable for steel, spun iron, cast iron, ductile iron or asbestos cement pipe. Waffle gaskets resists climatic conditions, petrol, oil, gas and water. Gasket cemented in correct position for ease of installation. Gasket approved for use with portable water. Self-stabilizing finger brackets to prevent bolt bending. Stainless Steel Full Repair Clamps provides an economical and permanent method of repairing damaged pipes, from pin hole leaks to full 360° circumferential breaks. This clamp is particularly light-weight and easy to handle, light weight, stainless steel body claim supplied complete with MCI brackets and high tensile plated bolts. 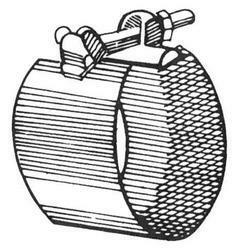 Suitable for steel, spun iron, cast iron, ductile iron or asbestos cement pipe. Waffle gasket resist climatic conditions, petrol, oil, gas and water. Gasket cemented in correct position for cease of installation captive bolts eliminate loose parts corrosion proof. 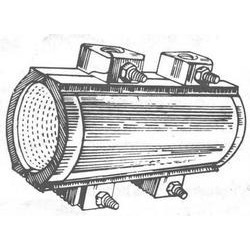 We offer a wide range of high quality Industrial Handiband Repair Clamp to our customers. Clamps hold metal, wood and plastic in place firmly, so you can complete construction and repair jobs with confidence.. It can be used for almost any type of pipe material, same or dissimilar materials like ductile iron, cast iron, steel, asbestos cement, coated pipe, and plastic pipe like PVC, GRP, PE etc. MCI Repair Clamp consists of two half housing, in malleable iron, into which are fitted waffle gaskets and stainless steel bridging plates, MCI Repair Clamp can easily and quickly be assembled by just tightening four captive bolts an guarantees leak-proof. Pipes sizes available from 80 to 200 mm NB. Looking for Repair Clamps ?